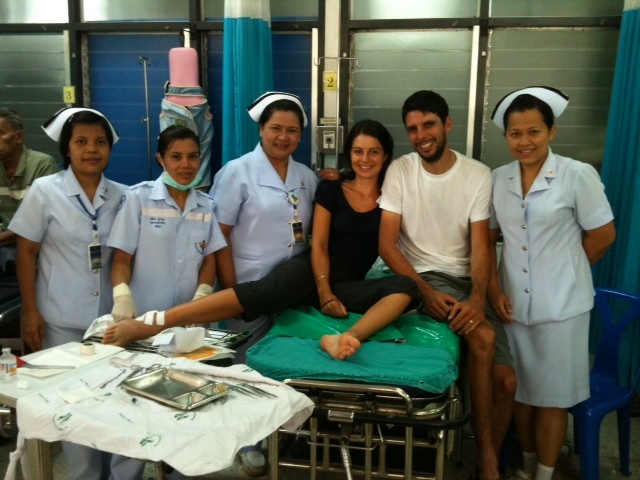 Thailand’s health care system needs many improvements. There are several areas that could be enhanced. There are problems with this system in the urban areas, but they are even worse in the rural areas. In the urban areas, they have problems with the types of doctors and the accessibility of the doctors. On the other hand, the rural areas have problems with the amount of time the doctors are there, and also the means of transportation to the clinics. Many villagers cannot get to the hospitals because they are too far away. The clinics in the rural areas are also very small, but service a large amount of villages, some even 14 km away from the hospital. The Thais have started to improve their health care system by making it more universal. The majority of the population is covered under the Universal Coverage Gold Card, but there are still problems with this system. There are several problems with how the Thailand health care system is run. The article, “Healthcare in Thailand”, tells its readers that one of the main problems with the system is that many doctors are not general physicians; most of them specialize in a specific area. This is problematic when a patient doesn’t know what specialist to go to. Patients who have minor problems with their health might have a hard time finding a specialist who can treat it. This is because the specialists concentrate on the larger issues in their specific field, rather than general practice. The article, “Healthcare in Thailand”, suggests that the solution to this problem is finding an internist. An internist is a specialist in internal medicine, which is more of a general practitioner. This article also describes how the doctors work many hours at many different hospitals. These doctors work very often, which makes them busy and hard to get in contact with. Since they work so many hours, if something comes up after their appointment, it could be very difficult to contact a specific doctor. This is because they could be in a different hospital or rural location with other patients. Another problem that Thailand has is that they don’t have an efficient emergency transportation system. Since they don’t have many ambulances, emergency situations can often lead to fatality or serious problems due to heavy traffic. The article suggests that one solution to traffic congestion problems would be to go to the local Police Hospital, such as the one at Ratchaprasong Intersection (a specific site within the city of Bangkok). Thailand’s emergency transportation needs to be greatly improved by developing their emergency equipment and road system. Thailand is working towards a health care system that allows affordability for anyone. The video above tells us that there are three different types of health care schemes: Thai Civil Servant Medical Benefits, social security, and UC (Universal Coverage) Gold Card. Most Thai people have the UC Gold Card (or the 30 Baht System). The UC Gold Card allows for more universal and inexpensive health care. The cost for a visit would be 30 Baht, but free for anyone under the age of 12 or over the age of 60, for those in poverty, and also for those who volunteer in health care. This would allow equal opportunities for people to receive the health benefits that they need. Published in 2007, the statistics in the journal entry “Healthcare Utilization under the 30-Baht Scheme Among the Poor in Mitrapa Slum, Khon Kaen, Thailand: a Cross-Sectional Study” indicates that 86% of the Thai population have the UC Gold Card Scheme, and over 25% of the people enrolled in the UC Gold Card System qualify for free services. Though, this system fails to address the differences between the poor who are above (urban poor Thais), and below (rural poor Thais), the national poverty line. This makes the system work better for those who are slightly above the poverty line. This scheme has its benefits as well as its faults. This scheme makes health care affordable for those who previously couldn’t afford it. The amount charged to a recipient of services directly relates to their income level or age. This was only the beginning of reforms to the universal health care system. In November 2006, this program was altered and is now called the Universal Coverage Scheme. This now gives completely free health care (without restrictions) to any Thai citizen who does not have the Civil Servant Medical Benefit or the Compulsory Social Security Schemes. The following table shows the percentages of the population covered under each scheme. About 1/8th of the population has the Compulsory Social Security Scheme. This scheme is for workers and non-permanent employees in the public services. The Civil Service Benefit Scheme is for those who work for the government and their children is about 8% of the population. Although, some people in Thailand are able to get insurance from private health insurance companies, this is only represents about 2% of the population. So, as the table shows, most of the country has the Universal Coverage Scheme. This is also supported by the video shown next. This video has general information regarding the health care in Thailand. It discusses the Urban Primary Care Units and provides details about them. The Urban Primary Care Units are clinics that are located throughout the cities in countries. Some items that are concentrated on in the Urban Primary Care Units are medical treatment, health promotion, disease prevention, and rehabilitation. It also describes the great benefit that the Thai people now have: those who have illnesses whose treatment is difficult can now get insurance without being discriminated against. In order to fix some of the health care system problems in the cities, Thailand decided Urban Primary Care Units were necessary. The previous video, “Integrated Healthcare System: A Pre-requisite for Universal Coverage System”, illustrates how the Urban Primary Care Units are run. In the morning they have medical care and chronic disease screenings, and in the afternoon the doctors and nurse practitioners have home visits throughout the city. A study was performed on geriatrics in an Urban Primary Care Unit. The article written about the study, “Development of Age-Friendly Primary Healthcare: Case Study of One Primary Care Unit”, discusses how the senior population in Thailand is growing and will continue to grow annually, and how the senior population has more illnesses. This causes a demand for geriatric doctors and improved health care in this specific area, making this study pertinent to the development of an improved health care system. The study would lead readers to understand that the older generation requires more respect and attention, and therefore the health care workers must treat the seniors differently than they would a normal patient. This improves the quality of the geriatric health as people are more willing to go to the doctor. This demonstrates that the Thai are willing to adjust their Primary Care Units to improve the quality of the visits to the hospital according to the need of the community. 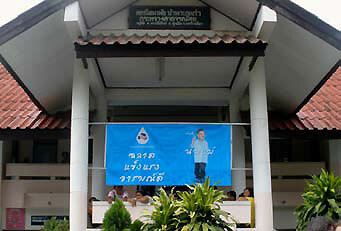 The following picture is of the Primary Care Unit in Wa Pu Kaew village in Thailand. But, what about the Thai citizens who do not live in urban areas? The journal article, “Towards Realizing Primary Healthcare for the Rural in Thailand: Health Policy in Action” they talks about a study performed on the health care for citizens in rural areas. The Thai people there have a seasonal income of about 3000 Baht (about $98), which is significantly lower than the annual income for the poor in urban areas. They also do not have the accessibility to the hospitals that urban areas do. In the study, the nearest clinic was 14 km away, which was too far for many of the villagers to get to. The clinics in the rural area serve around 2,800 villagers each and have very few health resources and a small capacity. On average, there are three nurses: a nurse manager, a general nurse, and a public health nurse. Health officials at the clinic in the study include a doctor who works about five hours per month, a dental assistant who is present about three hours per month, and a pharmacist who is there about three hours a month. The health field in the rural areas is extremely lacking in their resources, health care workers, and also transportation to the hospitals. 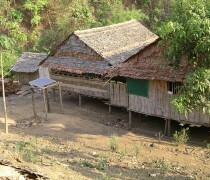 The following picture is of the Lay Ton Khu clinic on the border of Thailand and Burma. As you can see, this does not resemble the hospital that one would imagine, and if compared to a Primary Care Unit, as shown above, the differences are very distinguishable. By looking at the images, one can see the physical differences between urban hospitals and rural hospitals. The Urban Primary Care Unit is a well-built building with glass windows, doors and a metal roof. The rural hospital is open-air because the windows are just holes and the doors do not reach the roof, not to mention it has a thatch roof. One can imagine how unsanitary this could be. This could spread disease easier and make the healing process elongate. How can this one hospital service 2,800 villagers? How can this one hospital have enough resources to service that many villagers? The rural hospitals need to be greatly improved. The following suggestions could improve the health care system in Thailand. Thailand needs more general doctors, or internists. This will fix the problem of Thai citizens not knowing which specialist to go see with a problem; they can go to the internist for any problem. 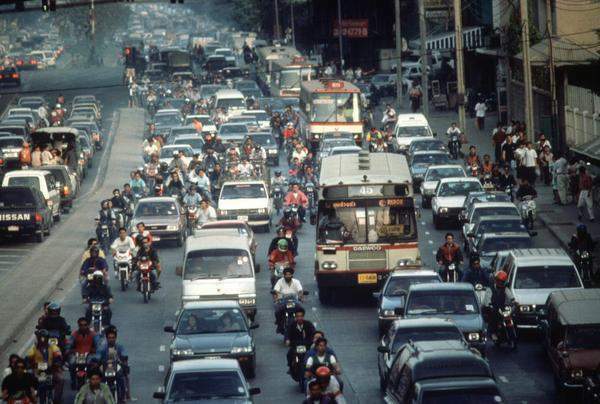 The Thais need a better emergency transportation system in the urban areas that will be able to bypass traffic. A way that this could be improved would be to make an emergency lane for emergency vehicles. To fix the problem with patients not being able to get ahold of their doctors after their appointments, the doctors could improve their means of communication. They could get more improved cellular service, or have specialty doctors on call. This would increase the accessibility of the doctors. The rural areas are where the most improvements are needed in the health care system. They could make a volunteer transport system that could get people from the villages that are great distances from the clinics to the hospital. This would encourage the rural citizens to go the hospital (since now, it is too far for them to travel to). Another improvement for the rural areas would be to have doctors there for more time. A good way to get more doctors there and to also get more resources is to have more involvement from outside volunteers. The Thais are already working towards a more uniform health care system. They could make more improvements to it. They could make it so that everyone covered under one plan. In other words, no pockets such as some citizens are covered by this plan, while others are covered by that plan. Ditton, Mary J., and Leigh Lehane. “Towards Realizing Primary Health Care for the Rural Poor in Thailand: Health Policy in Action.” New Mandala: New Perspectives on Mainland Southeast Asia (2009): 1-3. Web. <http://http://asiapacific.anu.edu.au/newmandala/wp=content/uploads/2009/08/Ditton-and-Lehane-2009.pdf&gt;. “Health Care Utilization Under the 30-Baht Scheme Among the Urban Poor in Mitrapap Slum, Khon Kaen, Thailand: A Cross-sectional Study.” International Journal for Equity in Health 2007 6.11 (2007): n.pag. Database. 28 Apr 2012. <http://www.ncbi.nlm.nih.gov/pmc/articles/PMC2040138/pdf/1475-9276-6-11.pdf&gt;. “Healthcare in Thailand.” International Expatriate (Expat) Health Insurance, Global Medical Healthcare. Web. 28 Apr. 2012. <http://www.allianzworldwidecare.com/healthcare-in-thailand&gt;. Hoontrakul, Duangporn. “Development of Age-Friendly Primary Health Care: Case Study of One Primary Care Unit.” Thai J Nurs Res 12.2 (2008): 131-141. Database. 28 Apr 2012. Integrated Healthcare System: A Pre-requisite for Universal Coverage System. Dir. Hsrithailand. YouTube. YouTube, 30 Jan. 2012. Web. 28 Apr. 2012. <http://www.youtube.com/watch?v=THcSgmo9MTM&gt;. “Joint Learning Network for Universal Health Coverage.” Thailand. Web. 28 Apr. 2012. <http://www.jointlearningnetwork.org/content/thailand&gt;. “Thailand: Summary of Reforms.” Joint Learning Network for Universal Health Coverage. JLN, 2012. Web. 28 Apr. 2012. <http://http://www.jointlearningnetwork.org/content/thailand&gt;.